Your go-to guide to improving gut health, boosting your immune system, and becoming a healthier individual overall! These 5 natural tips for increasing the health of your gut are easy to implement, backed by science, and actually work. Read on for you ultimate gut stability! Like kale chips, cauliflower rice, meditation apps, and IIFYM…all health fads that are ‘of the moment’…maintaining gut health is on many people’s radar nowadays. But what exactly does that mean? How does one achieve optimal gut health and why even strive for it? Well, I’ll tell you! Basically your gut can either keep you healthy or make you ill. It’s got that much power and influence over the body! Aside from your immune system, you also have ‘gut immune system’…this allows the rest of your body to stay protected from the toxic environment that your gut contends with on a daily basis. When you have poor digestion, inflammation, or a slow metabolism, your gut can not perform to the best of its ability and thus your overall health suffers. You gut is really your second brain! In fact, it’s got MORE neurotransmitters than your ACTUAL brain. Needless to say, it’s pretty important to keep it functioning in tip-top shape and up to speed. Today, I’m gonna help you with that. I’m sharing 5 Natural Ways to Boost Gut Health. Forget all things you’ve heard in the past, the tips that are shared on every list and roundup, today you’re getting the little known information, the insider tips on how you can make small changes that benefit your gut immensely. Fermented food provides the best kind of bacteria you can get for your gut! It provides a wide variety of strains which means you get the most bang for your bacteria buck. 😉 Fermenting foods has been done for thousands of years and it’s only now catching on again because of the resurgence of people’s focus on healthy immune and gastrointestinal systems. Some easy ways to incorporate fermented foods into your diet are through yogurt, sauerkraut, kombucha, kefir, and pickles! Eating plants and dietary fiber are important for overall health, but especially so for your gut. They bring diverse nutrients to our bodies which exposes us to things that make our bodies stronger and more resilient. The problem is, most of the vitamins and nutrients that vegetables and other produce provide cannot be absorbed on their own….they need healthy fats to facilitate it! Many of the micronutrients that food provides are fat-soluble. In other words, they cannot be absorbed without the presence of dietary fat. That means that if you eat produce without a fat source, you’ll only absorb a fraction of the potential nutrition you could be getting. An optimal gut environment is un-inflamed, and that’s exactly what healthy fats help with! When eating veggies, eat the WHOLE THING..including the stalks and stems. Don’t discard those as trash or compost! They stalks and stems of veggies are full of gut-boosting nutrients that we typically don’t get from our daily diets. For example, broccoli stalks contain more fiber, vitamin C, and calcium than the florets and Swiss chard stems are rich in immune-boosting amino acids. Our guts are balanced during our sleep. At night, we have a break from digestion and normal bodily functions which allows us to replenish and restore healthy gut flora. Additionally, cytokines, which are inflammatory agents in the body, are produced based on our circadian rhythm. When we have an abnormal or disrupted sleep cycle, their production is thrown off and thus the balance of our guts is adversely affected as well. On the flip side, having a healthy gut also promotes better, more restful sleep. So the two have a positively correlated symbiotic relationship! Stressful situations, changes in lifestyle, low quality food, tainted water, and numerous other factors can affect the bacterial flora in your gut. Taking a daily probiotic supplement can help replenish and bolster your intestinal tract, while making your system run more efficiently. Aside from aiding digestion however, they also trigger your immune system and help remove pathogenic bacteria. I take digestive enzymes and a probiotic supplement EVERYDAY! SmartyPants Adult Probiotic Complete gummy vitamins are my go-to brand for my daily probiotic supplement. Each serving of SmartyPants Adult Probiotic Complete delivers 7x more CFU than leading gummy probiotics and they use unique multi-strain probiotic in spore form. This is revolutionary because it allows the probiotics to survive the test of time, changing temperature, and harsh stomach acid in your body. Their probiotics reach all the way to your large intestine alive, where they can flourish, multiply, and help you and your kids thrive. SmartyPants Probiotic Complete gummies are vegetarian and made with premium ingredients. The sweeteners used are organic and Fair Trade, while the vitamins themselves are non-GMO, contain no synthetic colors, flavors, or preservatives, and are gluten-free and allergen-free. Plus they taste GREAT. Another thing I love about SmartyPants? for every bottle sold, they make a one-for-one nutrient grant to Vitamin Angels. Each grant provides a child in need with life changing vitamin A supplementation for one year. So far, they’ve helped over 2 million children…how amazing is that!? Do you monitor your gut health? What do you plan on incorporating daily to protect your immune and gastrointestinal system? Thanks to BlogMeetsBrand and SmartyPants Vitamins for sponsoring this post! As a dietician, I agree on all the points mentioned by you. I also think that drinking at least 8-10 glass of water is also very important. For sure! Hydration is so important for gut health! If 50 years in the future we take in everything in gummy form I really won’t be mad about it lol 😀 I’ve had gummy vitamins, but never probiotics. I would probably be much more consistent this way. Tip #4 is probably the toughest for me, but in theory I am with you on all 5! I have a digestive enzyme that I was sent to try for the blog, so I’m really excited about trying it, because i readily admit that I don’t have the greatest gut health. I think I’m going to be trying that, and I will definitely be keeping those healthy fats and crunchy stalks in mind. I totally didn’t know many of these things, and I’m so thankful you shared them. Our bodies are pretty cool! I think it will really help you! I’ve had great success with probiotics! Thanks for this list. I have begun drinking kefir in the last few months, and I take Zija which has pre-biotics, I’ve noticed that my gut is working so much better. Oh, and omitting the gluten was huge! I will be eating more stems, especially from broccoli, I had no idea that they were so good for you! As always, great information packed into a powerful post! Thanks again! I LOVE broccoli stems! Try them roasted! You’re so welcome for this post! I agree fully with your 5 natural ways to boost gut health. The fermented foods are definitely very important. I have never heard of the Smarty Pants probiotics – I will have to check them out. Thanks for sharing on Real Food Fridays. Pinned & tweeted! Love them too! They have such a wide range of awesome products! Your blog is spot-on. I wish more people realized how vital it is to eat healthy. Great read, I think I’m there except for the supplements. I’ll definitely check that out. Stopped by from Cooking on a Budget’s Link Party! These are great tips and for the most part I do pretty well, except for the sleeping part. Still working on getting back to routine. Great tips Kaila! 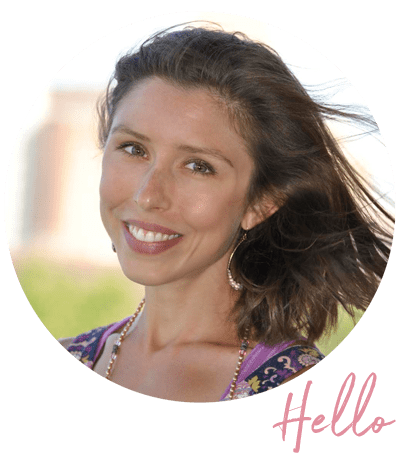 One of the things I enjoyed best while studying holistic nutrition was how they intensely we studied gut health and learned how our digestive system really is linked to everything, even our mental and emotional health. Thanks for sharing these at Healthy Vegan Fridays. I’m pinning & sharing! So welcome! I thought you’d enjoy this post!! I’d never heard of gut health but I’m already doing some of these things (I love munching on celery!). Thanks so much for sharing your great tips with us at Share The Wealth Sunday! Thanks for this great post. I have to admit that gut health is something that I’ve always taken for granted, but the older I get the more I think it’s important. I’m just coming off a round of antibiotics for a bacterial infection, and I remember hearing somewhere that taking these could adversely affect gut health? Wondering what you think might be the best way to get back on track after this round of medication? Thanks again, I’m enjoying your posts very much! Definitely incorporate these tips into your daily routine! Especially the foods that have good bacteria in them….those will help boost the good gut flora that the antibiotics killed off. I am so delighted to read your post on natural ways to boost gut health especially because a healthy gut has become a major concern for me. There’s so much to learn about this subject and your post provided healthy, easy to implement tips. I am also picking this post as the Featured Post on the Healthy Living Link Party this week. These are some great tips thank you! Thanks Emily! Hope they help! !